MECHANICSBURG, Pa. - July 22, 2016 - Daryn Pittman held off the Pennsylvania Posse in Friday night's Champion Racing Oil Summer Nationals opener at Williams Grove Speedway to score his seventh World of Outlaws Craftsman® Sprint Car Series victory of the season. "I don't know if I'm more nervous with (Hodnett) behind me or (Dewease) - neither one of them you want to see on the scoreboard," Pittman said in victory lane. "Man, we won again at Williams Grove… this is a special race track to win at." 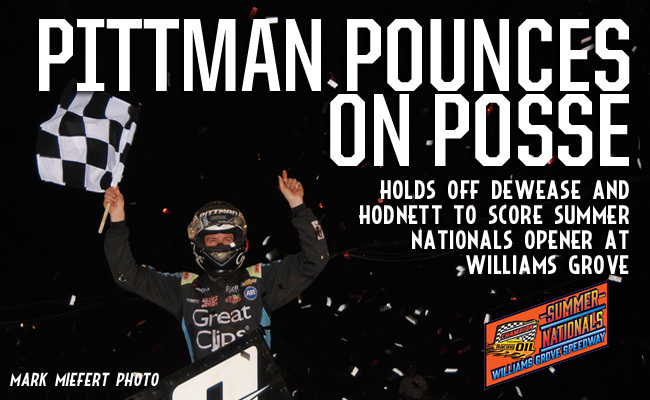 When the initial green fell on the night's 25-lap feature, Pittman jumped out to a strong early lead as Hodnett battled past Aaron Ott to take over the second position. Through a series of early cautions, Jason Johnson battled into the third position and then had to deal with a challenge from Dewease who drove his No. 69K Henry R. Sharman Builders, Kreitz Racing machine into the third spot and then second following a mid-race caution. "You knew the 69K came from a ways back and I wasn't sure what (crew chief Kale Kahne) was going to tell me to do under the red. I was kind of thinking 'man, I need to change my line.' And he said, 'just keeping running the top.' And I was like, 'man. are you sure?' That 69, I guarantee he's not running the top," Pittman said. "We got hung up in some lap traffic on the last lap and I felt like I made a pretty bad corner but luckily was able to hold onto it down the backstretch and was able to slide myself through three and four." The win gives Pittman his seventh of the season, good enough for the second-mostand propelled him to third in the championship point standings over his teammate Brad Sweet. The win is also the second for the Outlaws, who, with Schatz's victory at Lincoln Speedway earlier in the season, now have a two-to-one lead over the Pennsylvania Posse. "(This track) isn't my type of deal, this (car) likes it real slick. (The car) was really nice all night. Davey does a wonderful job. This is a new car - this is only like the third race on it. Davey and Donny, they work their butts off and I couldn't be happier to drive it as hard as I can for those guys." "We were really disappointed. We just weren't good to run the cushion all night and I don't know why," Hodnett said. "We were just balled up on it and loose off of it. We just weren't good enough to to run anywhere but on it and then not very good on it. The track was pretty different than what it had been all year so we've got a little work to do. Thankful to be on the front stretch with this group of competitors we have here." RACE NOTES: Daryn Pittman picked up his seventh World of Outlaws Craftsman Sprint Car Series victory of the season Friday night at Williams Grove Speedway and first at the track since 2014… Pennsylvania Posse regulars claimed the most top-10 positions with five while Outlaws regulars took three spots in the top-ten… Brent Marks was the night's KSE Racing Hard Charger, advancing 12 positions to finish in 12th… Tonight's pole position was Daryn Pittman's 11th of the season. He is the season's leading pole sitter. CONTINGENCY WINNERS - MSD Ignitions ($25 cash): Jacob Allen; MSD Ignitions ($50 cash): Daryn Pittman; Penske Shocks ($50 cash): Donny Schatz; JE Pistons ($50 cash): Kerry Madsen; VP Racing Fuels ($50 cash): Kerry Madsen; Edelbrock ($50 cash): James McFadden; Comp Cams ($50 cash): Brad Sweet; Morton Buildings ($50 cash): Brad Sweet; Cometic Gasket ($50 cash): Brent Marks; Super Flow ($50 cash): Jacob Allen; Craftsman/Sears ($100 cash): Aaron Ott; KSE Racing Products ($100 product certificate): Brent Marks; Comp Cams ($50 product certificate): Daryn Pittman; JE Pistons (Set of Rings): Paul McMahan; JE Pistons (Set of Rings): Logan Schuchart. SEASON WINNERS: Donny Schatz - 15 (Volusia Speedway Park on Feb. 14, The Dirt Track at Las Vegas on March 4, Stockton Dirt Track on March 18, Stockton Dirt Track on March 19, Silver Dollar Speedway on April 2, Lincoln Speedway on May 19, Weedsport Speedway on May 22, Lincoln Park Speedway on June 8, Knoxville Raceway on June 11, River Cities Speedway on June 17, Rockford Speedway on June 29, Badlands Motor Speedway on July 3, Cedar Lake Speedway on July 9, Attica Raceway Park on July 12, Eldora Speedway on July 16); Brad Sweet - 7 (Volusia Speedway Park on Feb. 13, Volusia Speedway Park on Feb. 14, Cotton Bowl Speedway on Feb. 26, Ocean Speedway on April 1, Bakersfield Speedway on April 15, Plymouth Speedway on May 13, Badlands Motor Speedway on July 2); Daryn Pittman - 7 (Royal Purple Raceway on Feb. 27, Perris Auto Speedway on April 16, USA Raceway on April 18, New Egypt Speedway on May 24, Jackson Motorplex on June 24, Eldora Speedway on July 15, Williams Grove Speedway on July 22); David Gravel - 5 (Thunderbowl Raceway on March 12, Tri-State Speedway on May 14, I-96 Speedway on June 6, Eldora Speedway on July 14, Lernerville Speedway on July 19); Shane Stewart - 5 (Arizona Speedway on March 6, Devil's Bowl Speedway on April 23, Lawrenceburg Speedway on May 30, Granite City Speedway on June 15, Brown County Speedway on June 19); Joey Saldana - 4 (The Dirt Track at Las Vegas on March 3, Devil's Bowl Speedway on April 22, Jacksonville Speedway on May 4, I-80 Speedway on June 22); Kerry Madsen - 2 (Eldora Speedway on May 6 and 7);Bill Balog - 1 (Beaver Dam Raceway on June 25); Lance Dewease - 1 (Williams Grove Speedway on May 20);Chad Kemenah - 1 (Fremont Speedway on June 3); Jason Johnson - 1 (Placerville Speedway on March 24);Terry McCarl - 1 (Knoxville Raceway on June 10); Logan Schuchart - 1 (Cedar Lake Speedway on July 9); Jason Sides - 1 (I-30 Speedway on April 26); Greg Wilson - 1 (The Dirt Track at Charlotte on May 27). World of Outlaws Craftsman® Sprint Car Series Statistical Report; Williams Grove Speedway; Mechanicsburg, Pa.; July 22, 2016.